After eight feature films and an ever more recognizable brand of cinema, we have come to expect a certain type of movie from Quentin Tarantino. He is, in many ways, the gold standard for many young and unapologetic film makers out there that think they have a new and distinct vision to share with the world. In the 1990s, Tarantino represented a break from Hollywood formulas that had been in place for most of the 1980s (with a few exceptions of course). To supplement his unique style of film making, Tarantino had the kind of rebellious anti-establishment personality to match that made his work instant cult favorites. After more than twenty years in the business and seven feature films under his belt, Tarantino is, per his own admission, an “old guy” who has managed to remain hip and cool to a substantial audience (listen to Tarantino’s recent podcast at Nerdist for more). However, what he did not say is that with time his so-called “style” has lost some of its edge. Though Tarantino gives us plenty to appreciate in his latest film: The Hateful Eight, there is less laughter, less surprise and less invention. When I listened to him speak recently about his progress as a film maker, I also heard Tarantino exclaim, as confidently as he always has, that he can see the growth he has experienced as a film maker when looking back at his career. Tarantino alluded as to how his methods have improved, to his awareness of scene construction and framing, and to a growing confidence in his own abilities. While one can’t deny his gifts as a post-modern wordsmith of dense yet vivacious scripts, none of his expertly conceived cinematic skills can be substitutes for lack of ideas. In fact, for the first time I left the theater feeling as if Tarantino had recycled and reshot some of what worked (and even what did not) from Django Unchained and films like Reservoir Dogs. Like in his debut, Tarantino hides the motives of most the characters so that the audience puzzles over the unspoken mysteries as the action takes place. Slowly, the truth is revealed, but instead of coming out in a sudden twist, it is revealed via a flashback sequence. Even though I realize that Tarantino is perhaps trying to present his neo-Western film through the prism of a playful Agatha Christie crime drama; I deemed the flashback sequence as unnecessary. Sure, it is fun to see Channing Tatum charm his way to a welcoming black lady by speaking French but, apart from that little pleasure, did the flashback scene really reveal anything in particular that couldn’t have been elucidated with a short confession or explanation? Did we really find out anything about the characters that was completely needed to appreciate the film fully? I think not. With time, Tarantino seems to have gotten cocky about editing. He loves his own creations so much that he no longer knows when to end them or when to trim the fat out of his films. 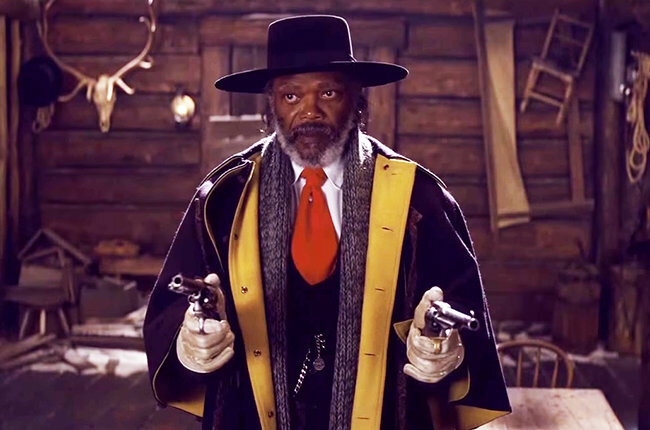 Though his work has always shown a fondness for violence, crass language and larger-than-life characters; in The Hateful Eight there is an overabundance of all of the above without achieving the kind of results he has in the past. As I ponder about what I saw and how it was constructed, there seems to be a whole lot of empty space in the film that is filled with humorous yet unimportant banter. At the same time, the film feels a bit ecstatic, not by the claustrophobic setting it takes place in, but by the steely pace it had at certain points, most especially in its first act. 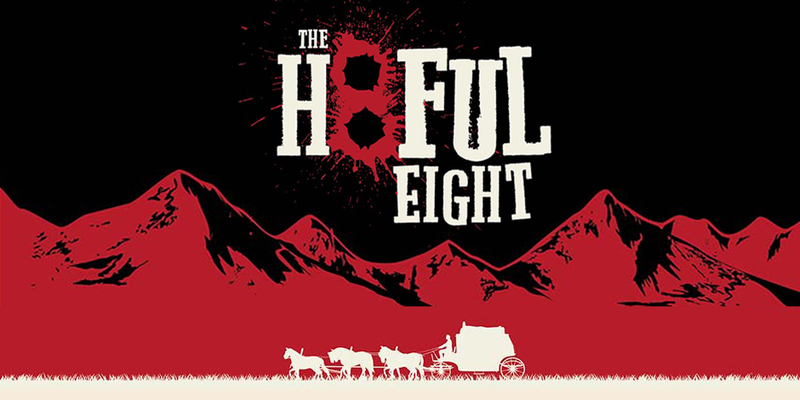 Elevated by the electrifying and never funnier Shakesperean verbiage of Samuel L. Jackson (rivaling his career best performances) and confident returns to the spotlight by Kurt Russell and Jennifer Jason Leigh, The Hateful Eight is as fun to watch as any other Tarantino film, but not as essential. Great review. Has its memorable moments, particularly the story Sam Jackson tells about the man he asks to strip naked in the snow. I agree he should trim the fat here, the screenplay(which is usually his strength) is too self-indulgent and in need of an editor. Too much forced, expositional dialogue. The Lincoln letter and nailing the door shut are fun at first, yet those aspects began to feel repetitive. The second half raises the stakes, but I agree it’s not the director’s best work. I liked some of the dialogue, unfortunately I didn’t really care who lived or died. 6/10 for me.